Do you despise training the weakest part of your body because of how sore you will be in 2 days? If so, then you know exactly what Delayed Onset Muscle Soreness (DOMS) feels like. Discover what you can do to get relief! DOMS is that uncomfortable muscle pain and soreness that you feel about 12-48 hours following exercise, particularly at the beginning of a new exercise program, or after a dramatic increase in the duration or intensity of exercise, but thankfully the discomfort subsides after a few days. Symptoms can range anywhere from tenderness in the muscle to severe pain. This soreness is your body's normal response to unusual exertion and is part of its adaptation process. For your convenience, we have highlighted various options to give you an idea of how to address muscle pain. There are various treatment strategies to help reduce the intensity of DOMS and to help the athlete recover as fast as possible. Non-steroidal anti-inflammatory drugs (NSAIDS) such as aspirin, ibuprofen, and naproxen, have demonstrated dose-dependent effects but can be influenced by when the dose was given. Remember, oral painkillers are known to bring about side effects and many problems can occur with the over medication of these oral drugs, which far outweighs their usage. Therefore, if you choose to go this route, the key word to keep in mind is: TEMPORARY. Therapeutic massage for pain relief has proven to produce varying results, which depends on the time and type of massage technique used. Overall, a weekly massage treatment does greatness to the overall health of an athlete as it helps to relax the muscles, reduce swelling, and improve blood circulation. Utilizing an external analgesic such as MuscleMagic Pain Relief Cream can provide long-lasting pain relief. Enriched with 100% pure Emu Oil, this all-natural composition imparts a gradual heating sensation and works to transport the active ingredients to the source of the pain fast for optimal alleviation. 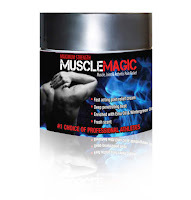 MuscleMagic Pain Relief can also be applied to the skin before exercise or physical activity to: help warm up and loosen muscles, enhance muscle utilization during performance, and minimize cramping. The added bonus of a muscle cream such as this all-natural solution is that it avoids the effects that are often associated with oral pain killers - making MuscleMagic an ideal factor in any workout regimen to alleviate sore muscles, before and after physical activity, especially when undertaking a rigorous training program or competing. Remember not to apply this external analgesic more than 3-4 times a day. Believe it or not, all in all, exercise is one of the most effective means of relieving pain during DOMS, but the analgesic effect is temporary. If you have to train on a daily basis, then you should reduce the duration and intensity of exercise for 1-2 days following the exercise that caused the DOMS. You can also train less effected body parts to allow time for the body to recover. Rest is a vital part of any workout regimen as your body requires ample time to recover. A good night's sleep is 7-8 hours and it is key to optimize your results. Yes, You Can Relieve Muscle Pain! Remember: Your body is designed to adapt to whatever stress is imposed upon it so if you want to grow, or get in better shape, you have to make changes periodically in your routine to avoiding hitting a plateau. Yes, any significant change in your workout routine can increase the risk of DOMS, however you now have the tools to address it as briefly highlighted above...and if you stay consistent, you will certainly reap the results!